Specialist family-run Jacuzzi dealership All Weather Leisure Midlands is gearing up to showcase 16 models from the iconic manufacturer as part of the ‘Grand Opening’ of its new hot tub superstore in Cannock next week. To help celebrate the successful relocation to a new showroom and the culmination of a commitment to recover ‘bigger, better and stronger’ from a major loss of nearly £30,000 due to theft; the All Weather Leisure Midlands team has compiled a bumper guest list for the Grand Opening on Thursday, November 9. It has been swelled by invitations being sent out to nearly 800 existing customers that have been served by the dealership in nearly a decade at the previous Shenstone Garden Centre location in Staffordshire. 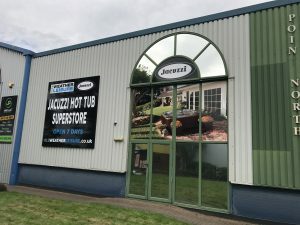 During the Grand Opening event, running from 5pm to 8.30pm, there will be the first official opportunity for guests to view all of the 16 Jacuzzi hot tubs on display in the new indoor showroom at Unit 4 Point North, Virage Park, Green Lane in Cannock, pictured, which includes a private changing room for anyone who wishes to try out one of the four full and ready wet test models currently being promoted by the specialist All Weather Leisure Midlands team. 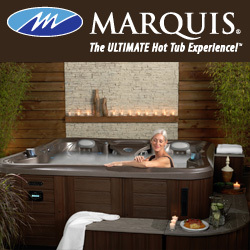 There will be food and drink served for visiting guests who are also going to be provided with the opportunity to stock up on their hot tub supplies at discounted prices and gain the chance to enter a free prize draw, which is being drawn during the event. For Liam Shelley and his son Luke, who are the owners of the family-run BISHTA member and WhatSpa? Approved business, the Grand Opening of their new All Weather Leisure Midlands showroom premises will also mark their commitment and effort to recover with a ‘bigger, better and stronger’ format from a devastating blow to the business last May, when £28,000 worth of stock was stolen. “We’re back on track, just bigger, better and stronger,” declared Liam and Luke in a joint statement.